Gallery forests are the ecological environment travelers encounter most frequently in Costa Rica. These are basically any forest you can look at straight on like pictures hanging in a gallery. Edge or gallery forest occurs where there’s a gap in the canopy and the ground and sides of the trees are exposed to much higher levels of sunlight than in an intact forest. 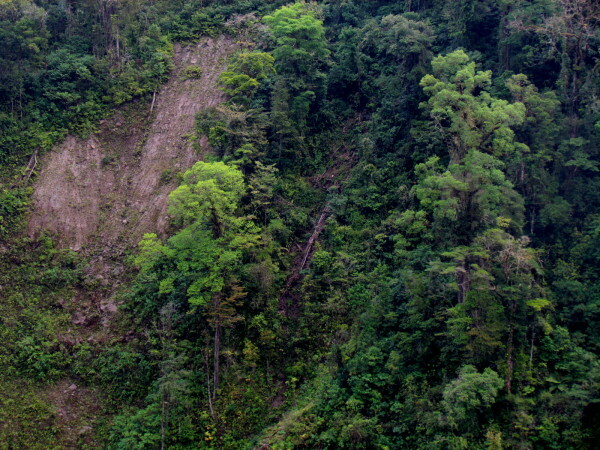 Gaps can occur naturally where the forest meets a cliff, river edge, the ocean, a landslide or when a massive 250 year old tree falls leaving a huge opening. Gaps also occur when bulldozers open space for a road, chainsaws and burning clear pastures or lots for housing developments. You’ve heard the saying “can’t see the forest for the trees.” Well you can see gallery forests and the trees because of the opening however it was produced. Not only can you see it but the sunlight can get in and that changes everything. A number of things happen when there’s a light gap. First, seeds which have lain dormant respond and germinate. Different tree species have different strategies. Some of the giants grow very slowly in the shade until they reach the canopy then break through and dominate, others like strangler figs start out at the top and work their way down, but the species that take advantage of light gaps and edges are different. Their goal is to get as tall as possible as quickly as possible so no other tree can put them in the shadows. Often they have very large seeds that store a lot of food to send up a tall shoot if large quantities of sunlight are available. 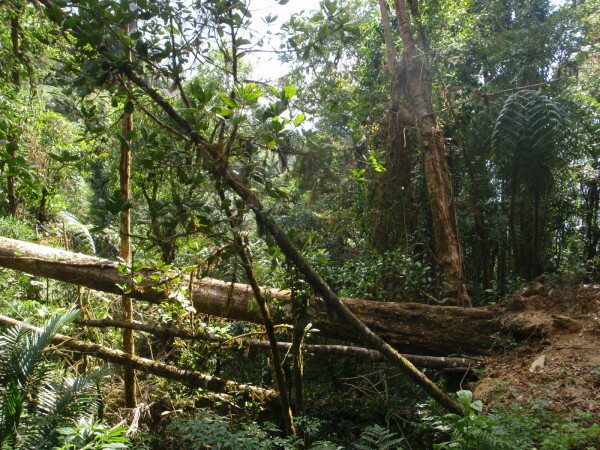 Because of the different growth strategies the tress that succeed first in temporary gaps or best in permanent gaps are different species than in a mature forest. Another thing that happens is that species that normally grow across the top of the canopy only occasionally dropping a root or shoot to the ground to seek nutrients and water start growing sideways. Lianas and vines normally use trees to reach the sun. They can’t support themselves so the attach to trunks and branches. Swinging on a vine hanging from a cliff edge gallery forest into the Rio Tigre would be less anti-climactic with more water. 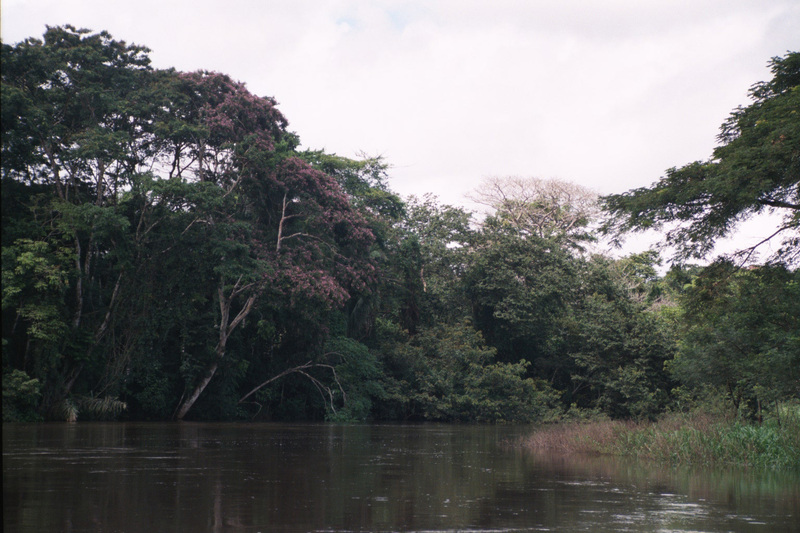 The phrase “impenetrable jungle” originated with gallery forests. The vines and lianas propagate profusely on the sun drenched trellis of trunks and branches where a forest edge is exposed creating a wall of green. Deep inside a mature forest the ground is relatively clear – either nearly bare dirt or a carpet of fallen leaves because few plants can survive in the darkness under the dense canopy blocking the sunlight hundreds of feet overhead. Finally some species that normally grow in dirt pockets high up on tree branches so they can access the sun sprout up and grow on or near the ground. These species are called epiphytes and tree falls or gallery forest are places you might get a good look at them up close. They are joined by grasses and herbs that normally grow on the ground but can’t survive in the deep shade under a healthy canopy. A thousand years ago gallery forest were a rare thing in Costa Rica only occurring permanently where a river was wide enough that the trees couldn’t arc over the top engulfing it in darkness. They appeared temporarily at rare tree falls and landslides. Human activity has created thousands of kilometers of gallery forest along the edges of farms. pastures, cities, towns, homesteads, and roads and unless you’re hiking through the center of a national park or wildlife refuge any forest you see is likely to be an edge or gallery. Gallery forest can occur in any ecozone – dry, cloud or rain forest – but is most dramatic in the rainforest. Some of the best natural edges are along the rivers and lagoons of Tortuguero national park and on the beaches of Manuel Antonio and Corcovado national parks.